I’m writing this wrap up blog to wrap up my trip and reflect on the things I learned and experienced. 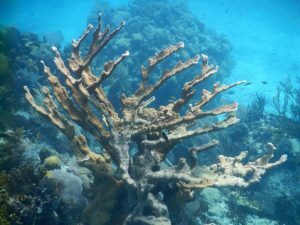 To start, because of the high biodiversity of both the coral reef and the rainforest, they are similar in their specialized nature. It is common to observe a species part of a symbiotic relationship with one exact species in both ecosystems. 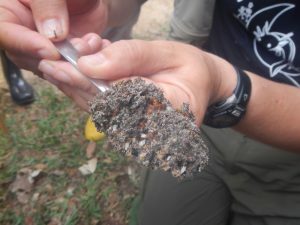 For example, leaf cutter ants and their fungus in the forest and stony corals and their symbiodinium in the reef. It is this specificity that contributes to the diversity of the ecosystem. Additionally, we learned that both ecosystems are nutrient poor, although for different reasons. 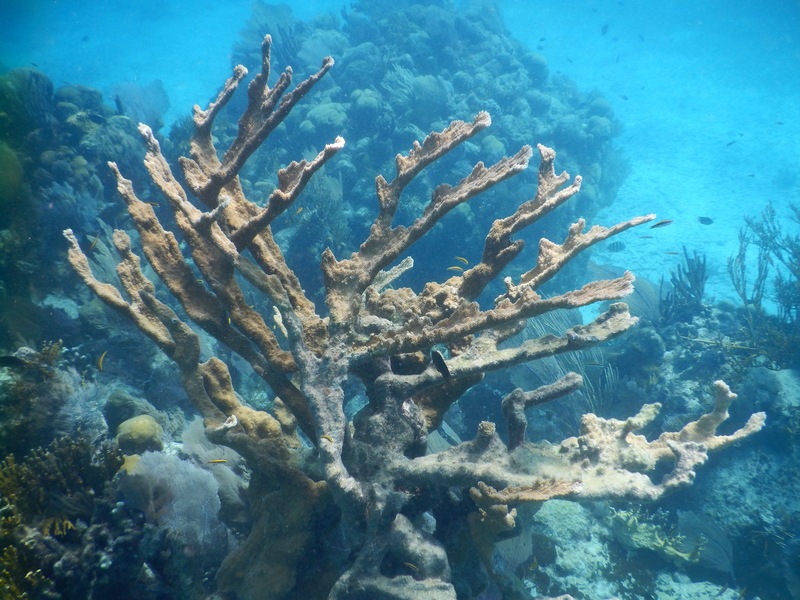 Coral reefs must maintain relatively low nutrient levels to grow, and nutrient cycling in the rainforest is so fast that the soils are relatively nutrient poor. Finally, we saw that both environments are under stress from human activities such as agriculture and climate change, among others. We observed the effects of these quite blatantly on this trip via marine debris, coral bleaching, and the lack of truly large trees. It is also sobering to remember that these places remain relatively untouched by humans. One of the major differences I noticed between the two environments was the secrecy of the wildlife in the forest. My best guess for why the reef appears to be much “busier” than the forest is because we were less intrusive in the reef. We quietly swam around and observed, while in the rainforest we trampled and macheted our way through. Overall, the course met and exceeded my expectations enormously. We learned and did so many more things than I expected. Also, we all got much closer as a group than I expected us to get in two weeks. We really had the opportunity to bond, and I think the friendships we made on this trip will be very lasting ones. It’s amazing what the jungle will do to you. 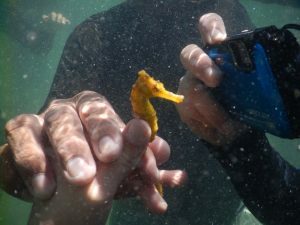 My favorite part of the course was our last day at Glovers, when we just got to snorkel around the Channel and the Aquarium and enjoy ourselves. The marine science was interesting, but I appreciated being able to chill and really appreciate the ocean. My least favorite day was the day that we set out our camera traps. Hiking and climbing itself were not that bad, however, I got really upset when we got lost in the woods. It really freaked me out to see the sky getting dark and the nervousness on Scott and Therese’s faces. Finally, the three things that I found most important/surprising about Belize are: 1) the overwhelming presence of plastic in marine debris. This inspired me to keep better track of the amount of plastic that I use. 2) There are many ways to interpret the same data. We spent many hours analyzing data, and I feel that we really learned to listen to everyone to gain as much input as possible. Finally, 3) the right gear improves your experience dramatically. For example, my first mask was terribly foggy and I was miserable, but I switched masks and everything got easier. Also, I have never liked hiking through dense forest, but with our pants and boots, I really didn’t mind it. 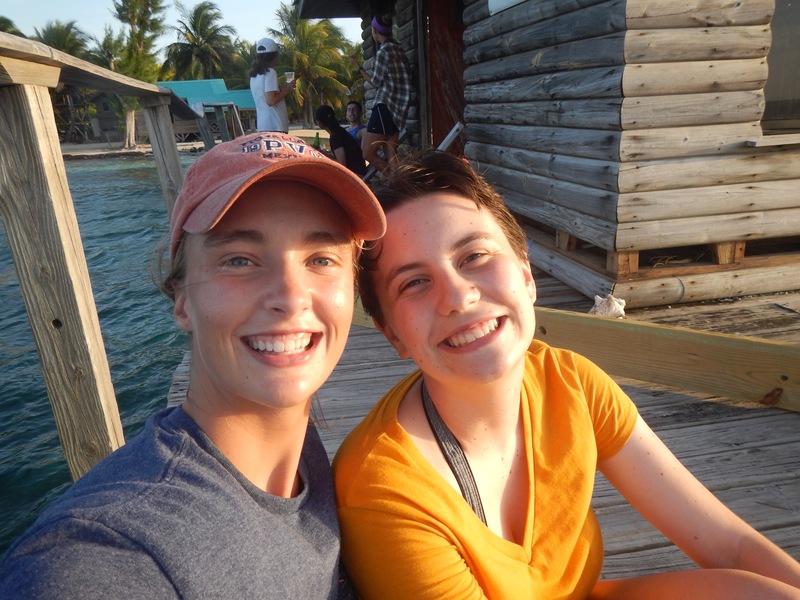 I’m sad to say goodbye to Belize, but I’m thankful for all the experiences and memories I gained along the way! Today (Day 15) was a loooooong travel day. We woke up early, had one last morning of birding, and got on the bus to head back to Belize City. It was a 5-hour drive, but luckily, we split it up a little. We drove for a couple hours and then stopped at a souvenir shop called “The Orange Gallery”. It had some very fancy things! I picked out a nice ornament for my mom because she collects Christmas tree ornaments from all the places we visit. On the second leg of our journey, I started feeling really really carsick. We had to briefly pause for me to throw up in the grass (ew), but I felt much better after that! The second stop we made was for lunch. I really liked this restaurant, and I even got to see one last epiphyte before we left Belize. There was a huge group of Aroids on a tree outside the restaurant. Our last leg of the trip dropped us off at the airport. Unfortunately we were running a bit late, so we didn’t get to stop to pick up Scott’s gear that he left at Glovers. Check in and security were extremely fast and relaxed, which we all appreciated. Once we got into the airport, we even had wifi! Everyone was very excited. Thanks to Ellie and Sarah getting searched, we all got to sit together on the plane home. Sarah, Damien, and I finished the crossword in a rapid-fire way (thanks to Sarah’s master crossword skills), and we finally assigned nicknames for everybody. We said most of our goodbyes at the airport, but a few of us went back to Rice on the bus. We had one last jam session together before it was time to go. Even Turiez joined us and taught us a few songs. I will miss Belize, but I do appreciate the air conditioning and cellular service that comes with being home! Today was a great way to end our time in Belize and Las Cuevas! I woke up early and took a very cold shower and did some birding. There were several scarlet macaws very close to the station, and seeing them through Scott’s scope was surreal. 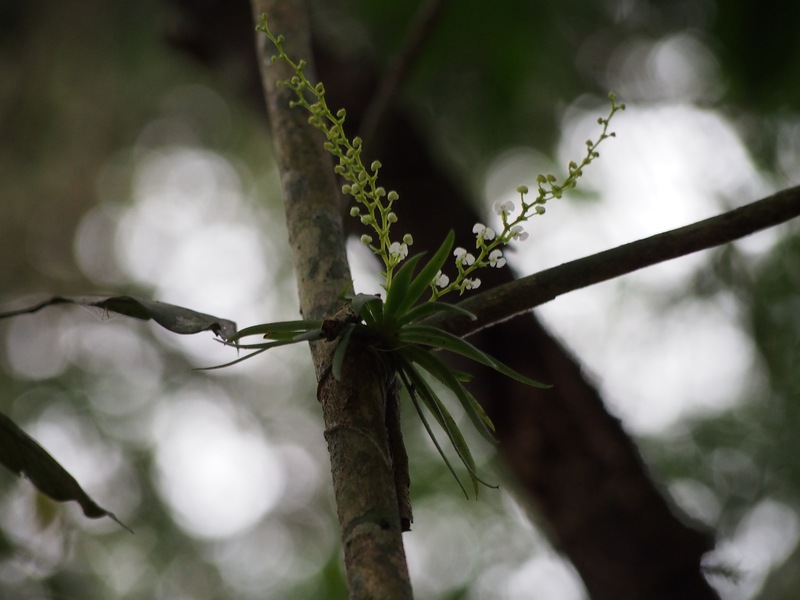 We spent the day out on the trails picking up the camera traps, but I wasn’t really paying attention to epiphytes. Whoops. We sped through the first trail; we did it in almost half the time it took us to set them out! The two big hills were not any easier to climb. We got back to the station early, so we did lecture before lunch. I’m relieved to be done presenting! After lunch, we went back out to the Monkey Tail Trail to pick up the last of the camera traps. We got lost again at the 3 km spot, like we did setting them out. I don’t know what it is about that spot, but it is disorienting! That trail took us almost 5 1/2 hours. We got back to the station in perfect time for dinner, and after we ate, we got to look at all the photos from the traps. 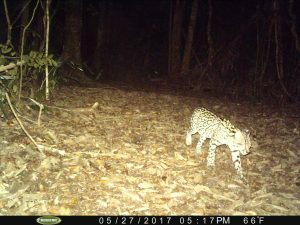 We caught some really great stuff on camera, including a Great Curassow, five Paca (big rats), a group of Peccaries, a DEER! !, and two ocelots! It was very exciting to see the pictures appear on the screen as they loaded. Ocelot Captured by our Camera Traps! We’re going to have a relaxing night here because we’re leaving early in the morning. I’m sad to leave Belize, but lucky for you, I still have two more blogs to write 🙂 I’ve learned soooo much on this trip, but somethings will never change: I still need to pack. Today was super cool! 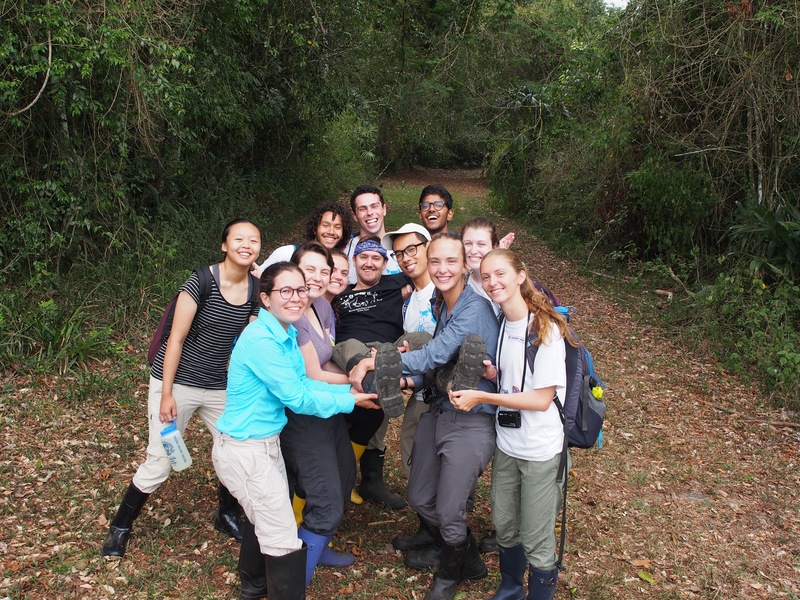 In the morning morning we collected our pit falls from the forest and analyzed all the arthropods we collected. We got a lot more than I expected! Our results were complicated and inconclusive for the most part, so I’m not going to discuss them here. After lunch, we walked down the the cave! This is the cave that all our water at the station comes from (maybe that’s why it’s so cold), and it is the cave that Las Cuevas is named after. It was amazing!! The archaeologists are coming next week to work on excavation, so most of the cave is closed. We got to see more than expected though! We walked through the huge first chamber and then squeezed through a restriction point into the large second chamber. In there, we did two of our lectures for the day! That was a really cool experience, and we’re the first 319 class to present inside the cave. After the cave, we listened to another lecture back at the station before we went out for our night hike. We hiked to the bird tower, which is a slightly sketchy observation tower on top of a large hill. It swayed a little bit in the wind, but the view was stunning. There, we listened to our fourth and final lecture of the day. Before we left, we took some cute photos by the tower! No new epiphytes here though. We came back to the station and ate a late dinner. After dinner, several of us played cards. We went out to look at the stars, and it was one of the most beautiful views ever. I’ve never seen that many stars! While we were out there, some howler monkeys started grunting and growling. At first we thought it was Scott snoring, but it got very loud very suddenly. That spooked us, so we ran back to our rooms and locked the doors. Now it’s bed time! Tomorrow is our last day in the Chiquibul 🙁 We’ll be picking up the camera traps, so it’ll be lots of walking. I’ll let you know how it goes! Day 12 was great! We got to sleep in a little (6:30 haha). During breakfast, Scott handed each of us two 50 mL vials and said “go to the bathroom and fill these halfway up”. That was very awkward at first, but we needed the nitrogen to run today’s experiment. We went off into the trails and left our vials along with two water vials in the trees and on the ground to test if arthropods (insects/spiders/etc) prefer 1) nitrogen or water and 2) the trees or the ground. We’ll collect and analyze that data tomorrow. In the afternoon, Scott took us out to dig into several leaf cutter ant colonies. We were looking at the colony structure at various ages of maturation. It was pretty cool! We were very grateful for our rubber boots. As wonderful as skipping lecture was last night, today we had to make them up, so we had seven lectures to listen to! It was a lot, but they were all very interesting. After lecture, a few of us put our boots back on and went searching for tarantulas! We found a few small ones on our own (and a very surprising bird!). On our way back to the station, we ran into the arachnid specialist who is staying here as well, and she helped us find many more tarantulas, including two very large ones! She even let us “help” her look for jumping spider samples. Today’s last treat appeared as we were heading back to our rooms for bed. I looked down and spotted a Black Orchid! 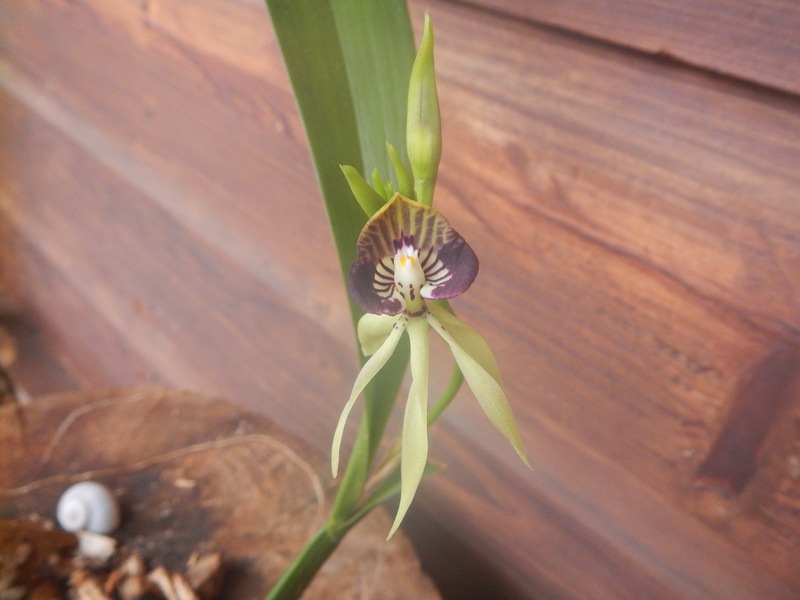 Otherwise known as Prosthechea cochleata, it is the national flower of Belize! I was very eager to see one, and Adrienne told us to report back if we see one. Hopefully she continues to read the blogs! The lights just turned out for the night, signaling that it is time for me to go to sleep. Tomorrow we are picking up our urine experiment and hopefully hiking to see the cave entrance. Our time in Belize needs to slow down! Today (Day 11) was not my favorite day, but I still had a good time. We woke up extra early and did a little bird watching. There wasn’t much to see, but listening to their calls was really neat! 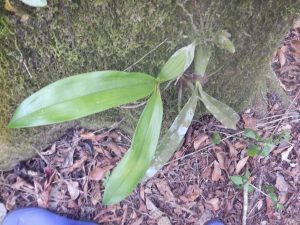 It wasn’t a great day for epiphytes 🙁 The only new spots I have to share with you are a few unidentified orchids. They all look the same to me without flowers! I’ll include photos anyway! After breakfast, we designed an experiment using camera traps. They are cameras with motion sensors that biologists leave in the environment to try to capture photo evidence. We’re hoping to analyze the distributions of big cats and their prey. Hopefully we’ll get some good photos! We spent the rest of the day setting out the camera traps. Before lunch, we set 6 traps out on a trail that had two extremely steep hills that I was not expecting. That was tough hiking! Also, half of our traps were placed off the path, and that added two additionally “Bonus Hills” (as Scott liked to call them). We got back to the station more than an hour late for lunch, so we also got a late start for our afternoon hike. 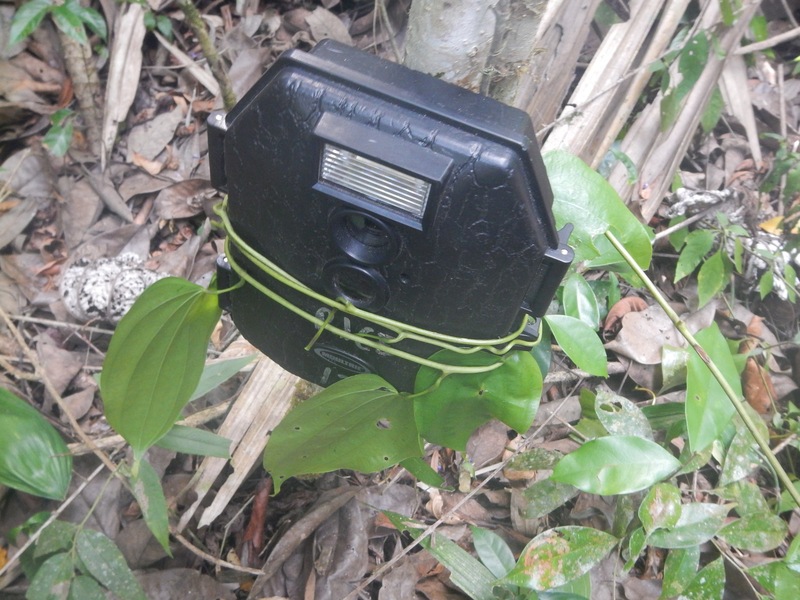 We set out 8 additional camera traps along one of the bigger trails. That was exhausting. Also, we got “turned around” while trying to find our way back to the path, so we spent 35 minutes tearing through dense jungle behind Scott and his machete. I was very nervous that the station staff would have to come rescue us because it was starting to get dark. Five hours later, we returned to the station almost two hours late for dinner. I spotted a Bothrops asper, the most dangerous snake in Belize. It was just a small baby, but it’s still venomous. I almost stepped on it; it moved, so luckily I was able to jump over at the last second. We’re all absolutely pooped, so Scott gave us the night off. No lectures!! As soon as I finish this blog, I’m going to pass out on my bed and try to get a full 8 hours of sleep (unheard of!). Scott promises that tomorrow’s adventures are less intense, and hopefully we’ll all be recharged for the fun! 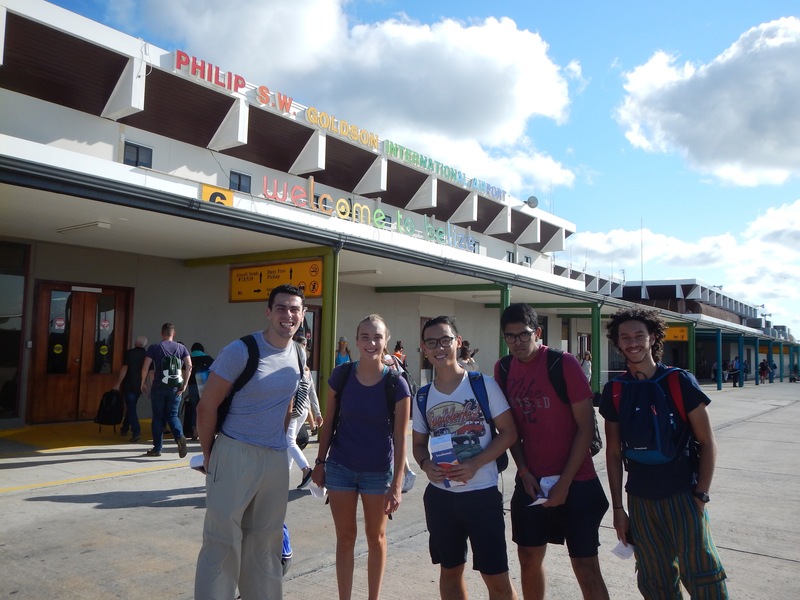 We’re arrived in Las Cuevas! There are lots of bugs and no internet, but it’s comfy. We started the day at the ecolodge and left around 8:30. 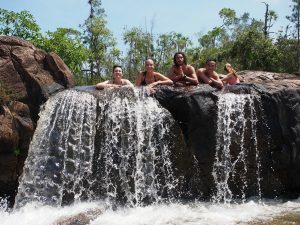 We drove about an hour to this place called Rio-on Pools, which is essentially exactly what it sounds like. It’s a slow moving river that winds through this area and forms these pools of water and waterfalls. It was really fun to swim around and climb on the granite slabs. We took some really cute photos on the rocks and group photos in front of the beautiful pine forest background. It was our last swimming experience, which is a little sad, but it was a good way to end! We drove for two more hours and arrived at Las Cuevas. We played games in the van as a group, and that was a super fun bonding experience! 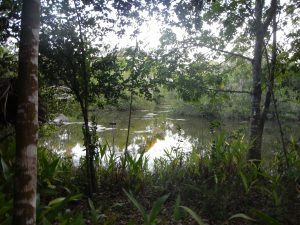 Once we got moved in and briefed at Las Cuevas, we took a short hike on the trails through the forest. I saw several epiphytes! In addition to the Tillandsia and Aechmea bromeliads I had seen before, we saw two species of orchids with flowers! I’ve included photos, and I will work on identification with the book. We saw at least one more species of orchid with no flowers. There are several Mayan ruins scattered throughout the nearby rainforest, but they are unexcavated and overgrown. We got to climb up the side of one of the pyramids. It was fun to climb so high! The first day in the forest was a success, and I hope tomorrow is just as cool! We woke up in the Belize Zoo but left early. We took a bus to the ATM Cave, which was one of the coolest places I have ever been. Sadly, cameras are not allowed in the cave, so I don’t have any photos to show you. We quickly became master spelunkers! 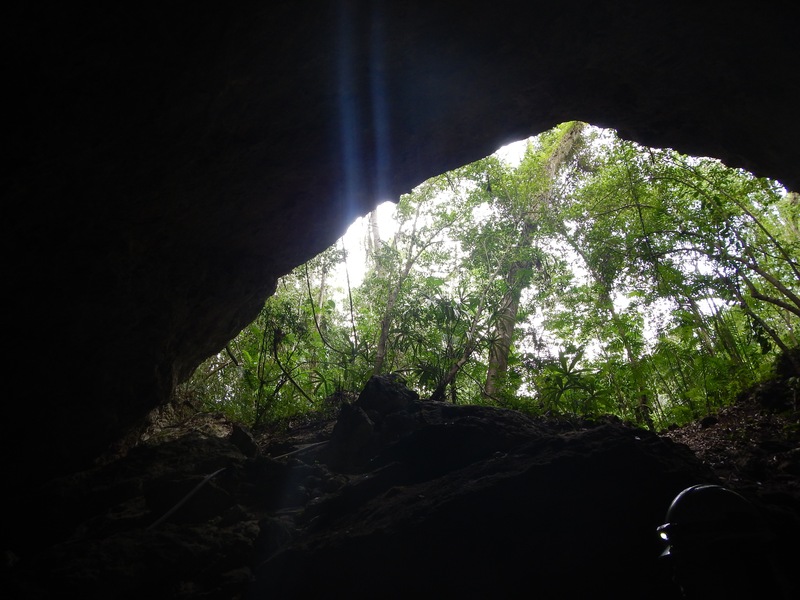 We had to swim through the entrance of the cave to access it, and we waded through the freezing water deep into the mountain to see some ancient Mayan artifacts. The cave was freaky at first, but once we got used to it, we loved crawling through tight spaces and ducking under the overhangs. We begged our guide to take us down the most interesting paths he could! 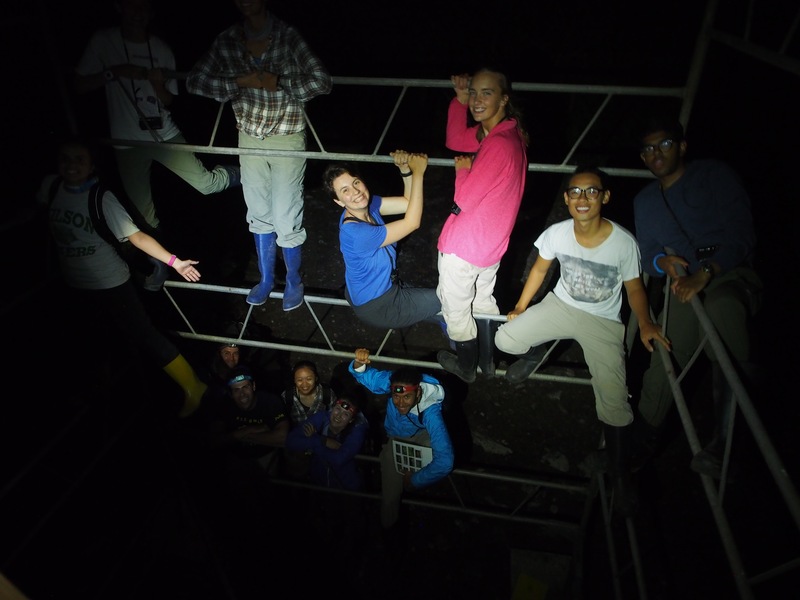 He even made us turn off our headlamps at one point to appreciate the darkness of the cave (it was super cool). To reach the artifacts, we even had to scale a 50(ish) foot rock wall! At the top of the wall, deep inside the cave, there were many Mayan ceramic pieces and several sets of human remains! They were amazing to see. We even got to see the famed “Crystal Maiden”, although it was recently discovered that she was actually a 16-year-old boy. When we left the cave after several hours of adventuring, we emerged into a rainstorm in the forest! I was so excited to get the full experience of rainfall in the rainforest. We had to hike for a while and cross several rivers to get back to our bus, and we had a great time splashing and enjoying the water. 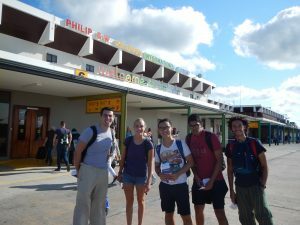 On our way to the ecolodge that we are staying in tonight, we stopped in San Ignacio to walk around. We visited a town square and an open air market. What a great city! When we got to the ecolodge, we were extremely excited to find that there are bathrooms in our rooms! We have definitely learned to appreciate the little things. Sadly, there really weren’t any opportunities for epiphyte sightings today. 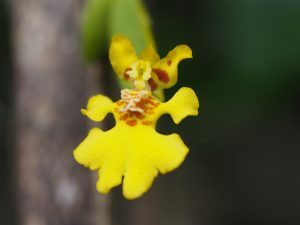 However, I did give my presentation on epiphytes! Two presentations down, and one to go. Tomorrow is another travel day, but we will finally be arriving at Las Cuevas! Today was a nice tourist-y day, but our break will end as the research continues tomorrow. We left Glovers around 8 and visited a research station run by the Smithsonian on our way back to the mainland. They had the BEST toilets ever: out on the end of the dock, looking out over the reef crest. Wow! Our last stop before the mainland was Twin Caye, an island of mangroves. We got to snorkel around, and we saw a manatee and a seahorse! When we got back to Belize City, we headed out to the Belize Zoo, where we are staying the night. We took a hike on a trail, and I saw loads of epiphytes! I could identify some of them, and Adrienne even crossed a river bed to help me. More epiphyte details to come in the following days. Dad – we think we saw a chachalaca! After dinner, we got to take a night tour of the zoo and see all the nocturnal animals out and about! We got to feed a tapir, see several different owls, and ogle over 4 species of cats. Junior the jaguar did somersaults for us, and I think it was one of the cutest things I’ve ever seen. The ocelot ran over to us and purred, and it reminded me of my kitty back at home. 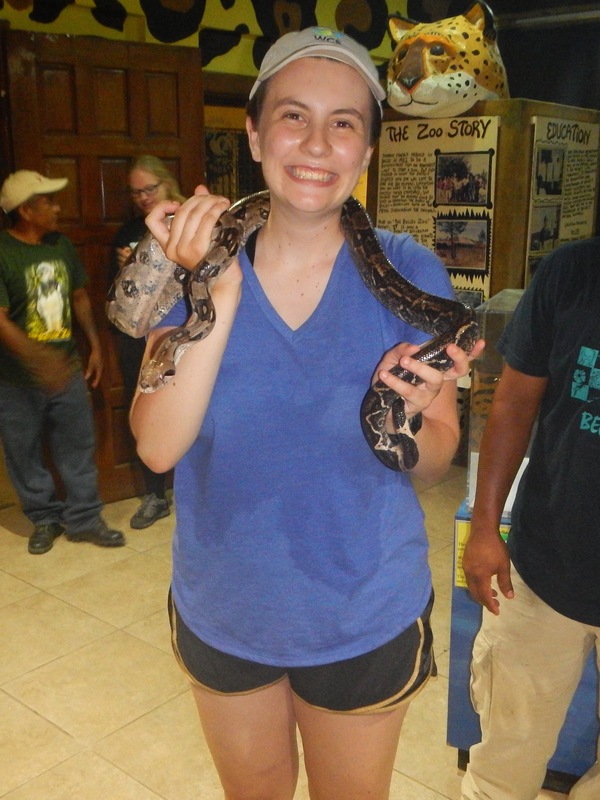 I even got to hold a boa constrictor. This is our last night staying in the Belize Zoo. I will miss this place! 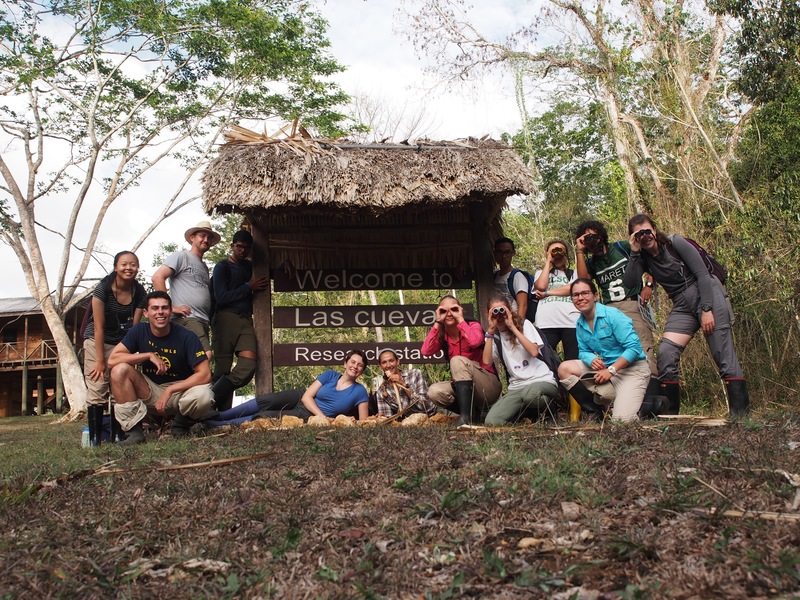 Tomorrow we will head toward Las Cuevas! Mom – We have pretty good wifi here, so I am about to add photos to all my old blogs (If you click on the tag “Jordan” at the bottom of this post, you can see all of them)! We definitely saved the best reef day for last! We went boating all around the atoll and snorkeled all morning. We started at the Channel, and I think it was my favorite reef of the whole trip! I finally got to see Dendrogyra cylindrus. 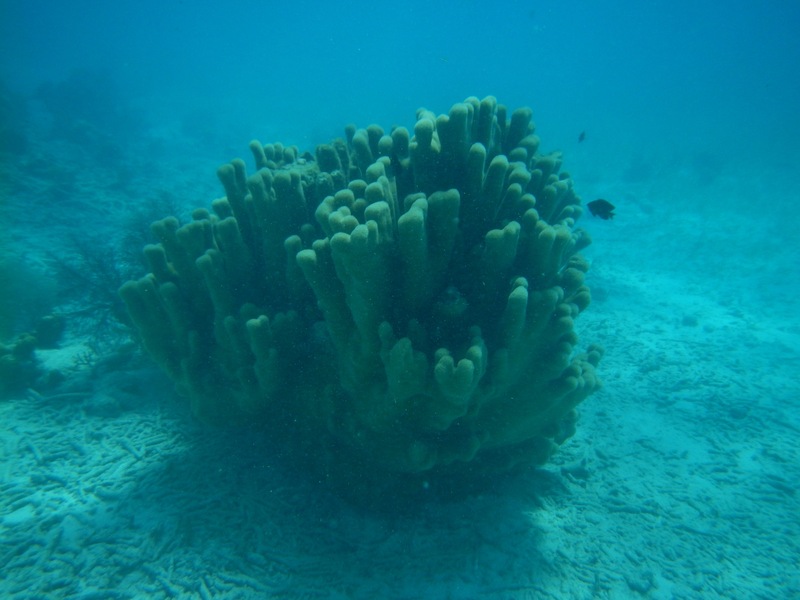 I also got to see several Eusmilia fastigiata (Flower Coral) and some massive Acropora palmata. They were bigger than me! After that, we went to a spot called the Aquarium. It was really shallow and easy snorkeling. I spotted a flounder! I also saw my first Montastrea cavernosa. 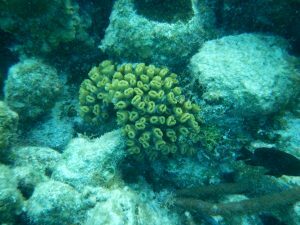 Unfortunately, I never found a Pineapple Coral (Dichocoenia stokesi). Despite that, I had such an amazing time at the reef this week! The fun didn’t stop after lunch. We dissected the Lionfish that Scott has been hunting throughout the trip. Mikey and I’s had 7 fish in its stomach. It was pretty gross. We compared the size of our fish to the fish that they caught on the 2015 trip. After analyzing that data, we took a boat to a nearby island and had a wonderful evening on the dock. We could not possibly ask for a more perfect goodbye to Glover’s Atoll. The ocean and sunset were absolutely gorgeous! Tomorrow we’re heading back to the Belize Zoo on our way into the Chiquibul Rainforest! Ellie and I on the dock, enjoying our last night at Glovers!